is a email marking tool where user can manage all of their emails in multiple lists. user can add more user to any list by using csv import feature. 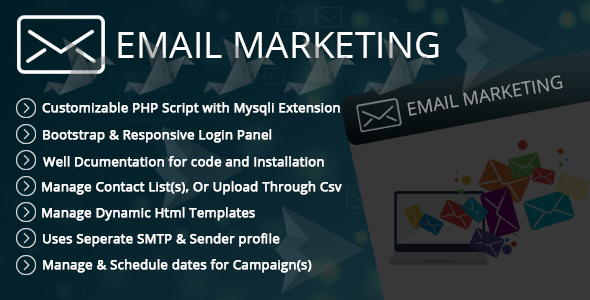 User can create multiple email templates for your email marketing campaigns. There is also multiple user can manage their own emails by registering on this tool. they can see only thier added data and campaigns and templates. Each user is having option to configure his own SMTP(s) and set limit for the day for his campaign(s). and their is a Sender profile setting feature also where user can set the number of email shoot at one cron call. In this project i have written well documented code in PHP and used Mysqli Extension for database. I put comments on all specific and required things in admin panel, I have used PHPMailer SMTP Library to send automatic emails/Cronjob. In this package you will get complete sourcecode and documentation to install this app on your host ,You can edit and customize any code. If you face any problem in installing and setup of this project , you can directly send a email on jeetendra.apps@gmail.com. Most probably I’ll reply within 24 hours. You can use this script to make a hosted app solution for marketing companies and digital marketers and personel product marketing panel where user can register and logging into your panel , add their own smtp details and perday limit to each smtp setting and also user can change your profile from sender profile.